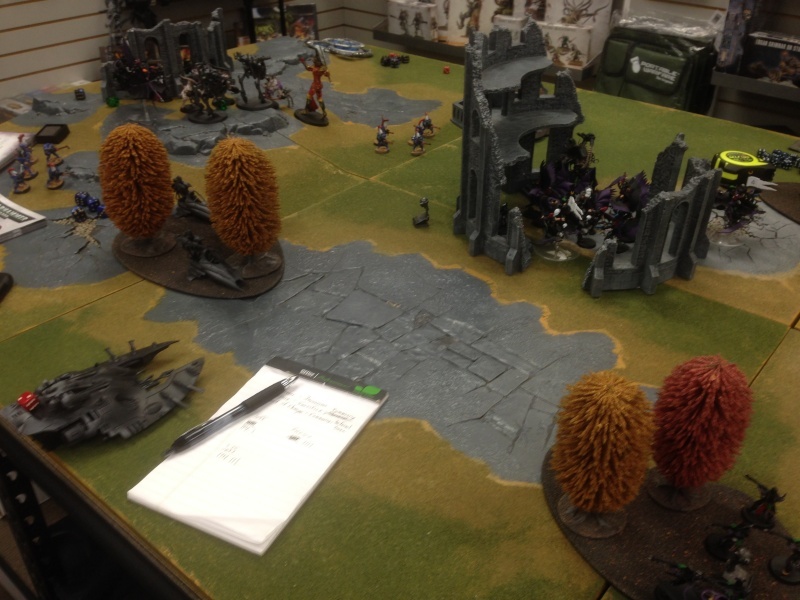 Game Setup: To describe the mission, there were 4 objectives and a player would score 1 point for each one they controlled at the end of their turns (2 points for each at the end of turn 5). 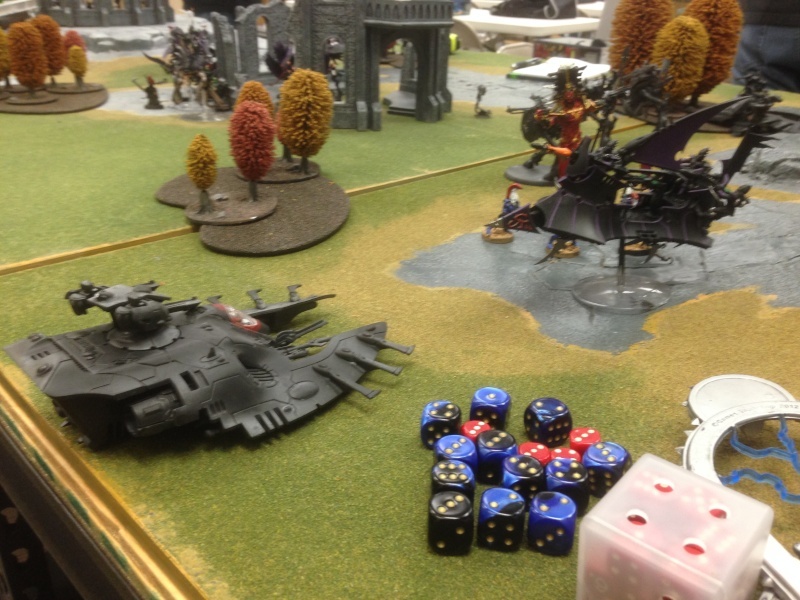 It was a 1500 point game with Hammer and Anvil Deployment. I took a bit of a gamble by placing my two objectives in the middle while he placed both of his on one side not thinking about how I could end up deploying first and choosing that edge (which I did of course). There was night fighting and he did not seize the initiative. I deployed just about as far up as I could being sure to keep the central ruins in front of most of my units in case he did seize the initiative. 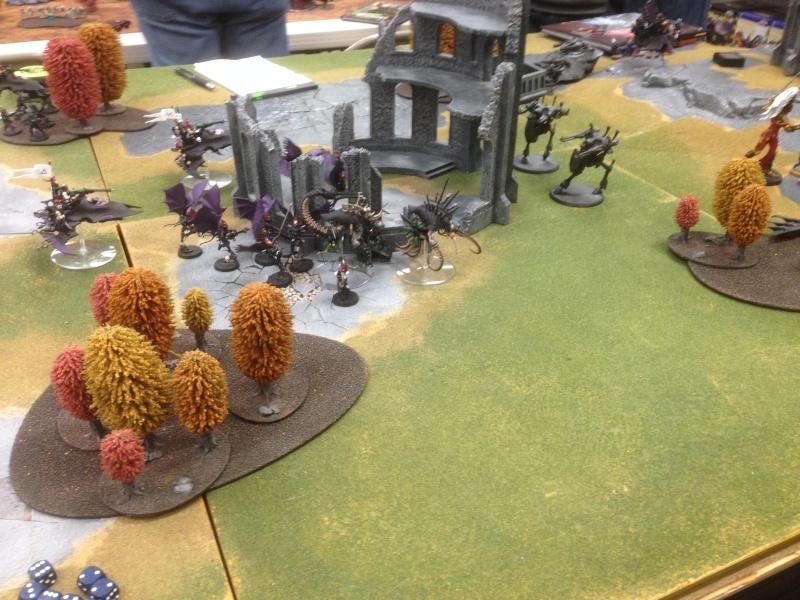 He kept his Wraithknight and Dark Reapers all the way in the back where I wouldn't be able to reach them with Venoms yet but had the rest of his army up front using the forests for cover. He also scouted the War Walkers straight ahead towards the ruins. Also, the pics won't be as good in this game. I didn't get many as we were going along and wasn't even sure I'd put this batrep up and you'll soon see why. I turboboost both Raiders full of presents deep into his deployment giving them a lot of potential targets for second turn charges and the ability to support each other if need be. Most of my other units advance more cautiously into the ruins in the middle where two objectives are located as a couple disembarked Warrior squads hold the ones deep in my deployment. I wanted to force the Wave Serpents to jink with my Scourges, but decided I'd like to get first blood even more. Unfortunately, the first unit only took one hull point from a Vyper so I had to fire the second into it as well to secure that point. I did make a mistake because I intended to boost the Venom with a squad still in it up far enough to get the 4th objective in the middle but I got carried away shooting at the Avatar with my Venom and forgot my plan. I did get a good number of wounds through on the Avatar but Feel No Pain saved his hide on 2 or 3 of them. Still, I scored 4 quick points for the 3 objectives and first blood. Both Dire Avenger squads disembarked behind my Raiders and the Avatar and War Walker Squadron turned around and marched back into his deployment to eliminate the arrogant Grotesque units. 2 Vypers, a Wave Serpent, a unit of Dire Avengers, and the unit of Dark Reapers just barely failed to knock down one of my Raiders. The second one exploded immediately from the Wailing Doom (I really wanted to make that 3+ jink save) putting that unit of Grotesque in a very bad spot. The second Wave Serpent, War Walkers, and second Dire Avengers squad wiped that unit out to a man giving me a good deal of concern for my remaining unit that still needed another couple turns before the Dark Artisan could support. 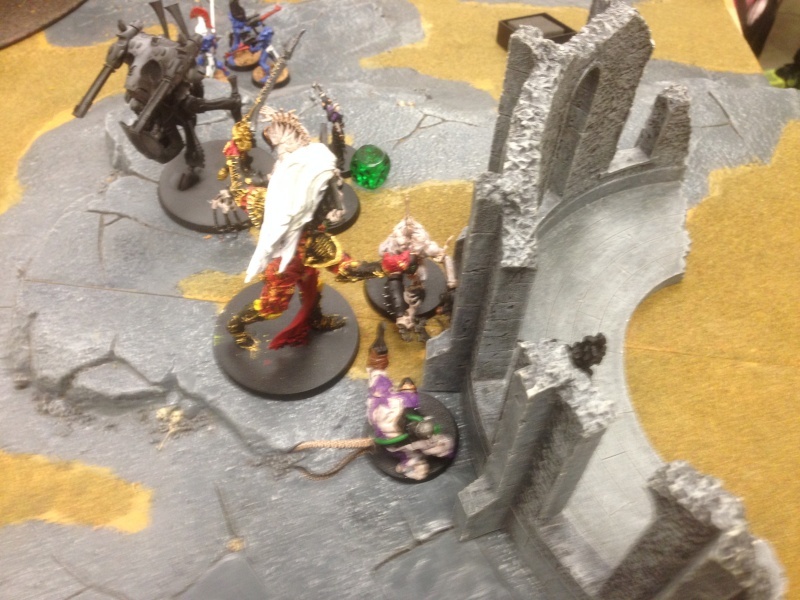 The Wraithknight fired two shots into the Dark Artisan and got 2 6's for instant death shots! Though I did have a 3+ cover save for nightfighting in the ruins, I did fail one and promptly lost the Cronos. 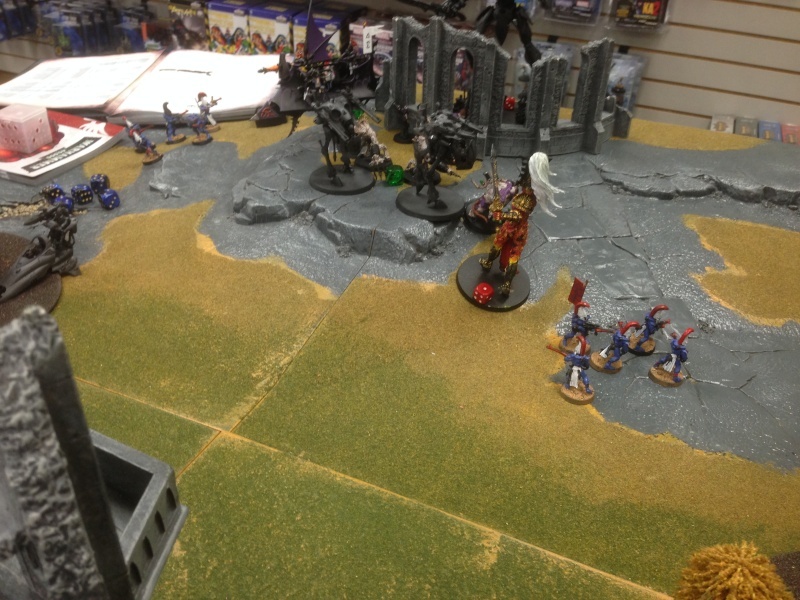 In the assault phase, I killed a couple Dark Reapers and my Aberration tore down one War Walker. I was getting a lot of wounds and penetrating hits in, but the invuln save on the War Walkers and 3+ armor save on the Dark Reapers was hard to get damage through. Sadly, my negative leadership bubbles were negated by the Fearless bubble of his Avatar. I did score 4 more points for my tight grip on the objectives. The Avatar turned his attention to the remaining Grotesque unit. The Wave Serpents and 1 Vyper shot into my Venoms who were getting cover saves but I didn't need to jink because of the ruins I was monopolizing on. He did destroy one and knock a Splinter Cannon off another. The Dire Avengers and Vyper that had jinked failed again to knock down my Raider (I might have to paint one of those "Lady Lucks" on the hull as a Wych or something similarly thematic). The Wraithknight got two more hits into the Dark Artisan (including another instant death one) but I passed both cover saves this time. The Avatar charges into the combat and does a couple wounds to my Abberation but fails to kill even him. The War Walkers and Dark Reapers may have managed to kill one or I just spread the wounds around a bit this phase. Now they are starting to rampage and getting obscene numbers of attacks but I still have a hard time punching through the invuln saves and Dark Reaper armor. I believe I killed one Dark Reaper and got one hullpoint off a War Walker. At this point, my opponent realizes he has ignored the objectives for too long and underestimated the survivability of my Grotesque so his plan shifts to hoping to table me. The surviving Raider boosts back towards my deployment zone to make a tabling less likely. My Dark Artisan continues its advance while poisoned shots bring down the Wraithknight and start to whittle away at the Dire Avenger squads. One of my Scourge squads leaves the safety of cover to get a good line of shots negating cover on a Wave Serpent and manages a crew stunned on the on the one near my Dark Artisan giving them a prime target for next turn. The second squad forces one of the Vypers to jink but fails to bring it down. In the assault phase, the Avatar steps his game up a bit and gets a couple wounds through this round. I manage to bring down another War Walker with my continuing rampage and knock the Dark Reapers down to just one or two more left. My Dark Artisan rushes into one of the Dire Avengers squads dispatching them with great haste and then consolidates right up to the nearby Wave Serpent that got stuck in place. I score another easy 4 points for objective control. I continue haywire shots into one of the Wave Serpents and remaining Vypers. 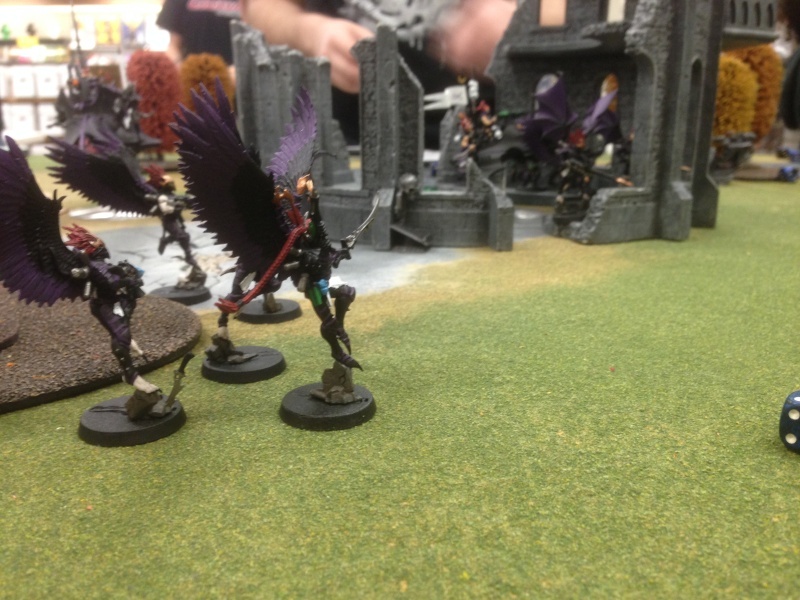 I take down one Vyper by shooting and knock down a couple more Dire Avengers. My Dark Artisan easily tear the trapped Wave Serpent to pieces and the Avatar finally crushes the rest of my Grotesque and Haemonculus unit. The Avatar is too far away to do anything else so he tries to hide in the ruins. The remaining Wave Serpent and Vyper knock down another venom and kill a couple more Scourges while the Dire Avengers kill one or two Warriors from the unit in the ruins. My last venom shoots down the Avatar on the exact same spot that he had previously killed the Wraithknight. My Dark Artisan lumbers forward to get linebreaker. My Warriors kill off his Dire Avengers and my Scourges fail to kill either of his remaining vehicles. He gives up on trying to table me (I still have 3 Warrior Squads mostly intact, the Dark Artisan, a Venom, 2 damaged Scourge units, and a Raider on its last breath) and hopes to get at least a couple points from the objective in the middle but he can't kill enough of the Warriors on it and they're fearless so they won't break. Similar to my last game, the Grotesque performed incredibly while my Dark Artisan mostly just drew fire and didn't actually kill that much as it slowly drifted across the table. I was scared when the first unit was dispatched so easily, but I had hoped the raider itself would survive more than one shot being aimed at it before it went down considering it had a 3+ jink. If the second raider gets a "Lady Luck" wych, that one is getting a Fat and Bald Warrior painted on the side to represent its performance. I was also nervous about the low number of anti armor shots I had and they did struggle to deal with the vehicles on the other side. That's why I prioritized the War Walkers with my Grotesque attacks a lot of the time because I knew I didn't have many other options for them. My opponent definitely underestimated the toughness of my coven and that really set him behind on the objective game. He thought he'd take them down in the first turn or two and then march back across to reclaim objectives and catch up in points. I think he should have used the Wraithknight to crush the Grotesque more instead of hoping for lucky shots into the Dark Artisan but to each their own. I also think he was holding on to too much hope when his plan shifted to trying to table me because I still had a lot of units spread out in a lot of different places. It was a fun game testing out the new units for me though and I can't argue against the results of the score. Another really good batrep. Thanks for posting. Really enjoying your list. You played it very well, although I agree your opponent made some odd choices, like not sending the Wraith Knight to help out with the Grotesques as Str 10 is one of the few things they fear. But you capitalized on the mistakes quite well, took his punches, and then counter-punched very effectively. Even thought our codex has been out for about five months now, I think people are still underestimating how effective our Coven units can be against the top tier armies that regular DE codex struggles with. Tau, Necrons, Eldar are typically bad matchups for the DE, but I actually think Coven heavy armies put us on quasi-equal footing. Thank you, sir. With flattery like that you may just coerce me into using it again for the last couple of matches of the tournament in two weeks. The point limit bumps up to 1750, but I have a theory that Reaver Jetbikes would make great support units jumping across the table in the first turn with the Grotesque.